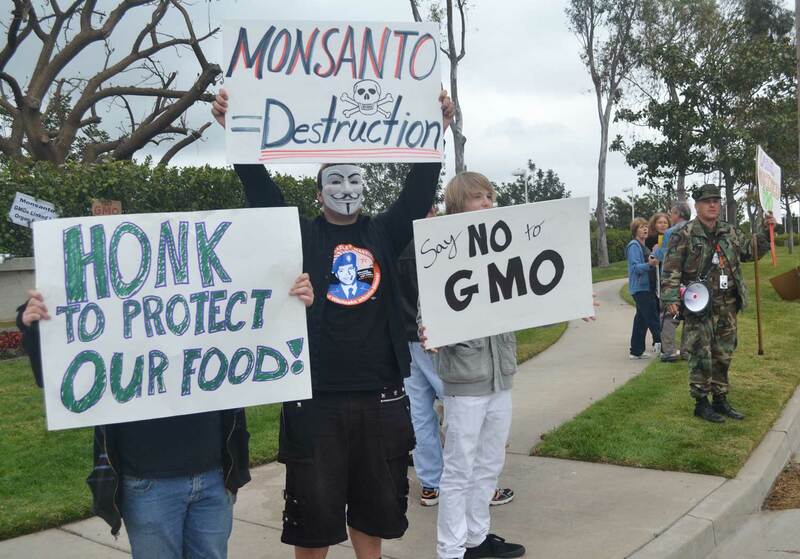 As an active participant in the Label GMOs (genetically modified organisms) initiative I am saddened to learn that Monsanto the mega seed corporation has taken over Seminis in Oxnard. 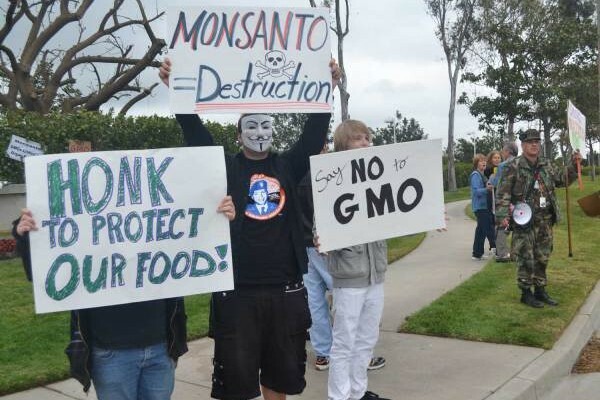 I not only fear that many of the surrounding agricultural areas will submit to the pressures of growing genetically modified foods, but also for the health people who work at the plant, in the fields and in the surrounding area in general. of industrialized farming with all of its toxic chemical uses in the form of pesticides, artificial fertilizers and herbicides. The idea that it doesn’t affect us or that it is somewhere else far, far away is simply untrue. The truth is that it does affect each and every one of us; though it is not immediately obvious. It is a slow process that can manifest in weakened immune systems trough exposure and ingestion of the foods grown in this way. This can eventually make us more vulnerable to disease. According to the research done by Institute for Responsible Technology, since the mid 90s there have been many studies that link GMOs to a rise in allergies, genetic disorders, Down Syndrome, ADD and a whole host of other neurological, behavioral and digestive problems. It makes sense when you think about it. Pesticides are made to attack the nervous system of insects and herbicides are made to kill living organisms. Hey aren’t we are living organisms with nervous systems too?! More recently, scientists have genetically engineered seeds that actually grow into plants and vegetables that have the pesticides inside the DNA of the plant itself. There has been very little research to show how this will affect human health and the companies that do the studies are the same ones selling the seeds. You can imagine that they are probably not going to publish something that can interfere with the profitability of their products. In my opinion the ever-shrinking number of food companies and distributors are playing a deadly game with human health and the health of this planet by continuing to experiment with Franken-foods and the use of deadly poisons that are known to cause cancer. I only hope that enough people sign the petition get these foods labeled so we can at least know what we are eating. The best thing you can do to help local farmers shift to more eco-friendly, sustainable practices is to request it. Ask your local growers at your farmers market where they get their seeds from, if they use pesticides and try to buy organic whenever possible. Better yet grow your own food or support a local community garden. We as humans need to re-connect with our role as stewards of the Earth, for what we do to it we inevitably do to ourselves. I know I’m not the only one who believes that it is basic right to have access to safe, healthy food that is free of carcinogens and toxins. 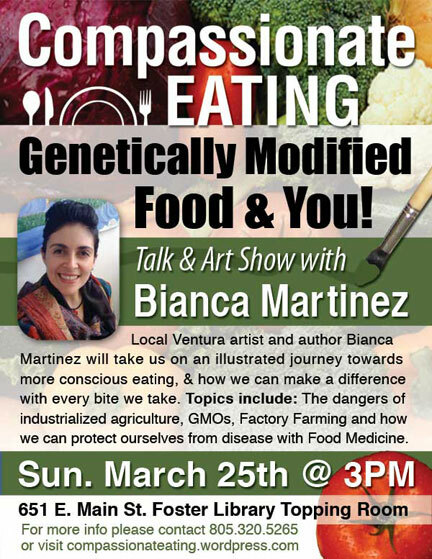 I will be doing a talk and art slide show at the Foster Library Topping Room on March 25that 3 pm titled Compassionate Eating GMOs and YOU! This is a free event with topics that include the dangers of industrialized agriculture, GMOs and how we can protect ourselves from disease with food medicine. Hope to see you there!